The Grumpy Cat meme is the revenge of your real self on the external world. Annoyance, cynicism and anger at different levels are feelings that we would like to express most of the time but we are forced to repress them because of social rules, others’ expectations and many futile laws that we live by in modern society. 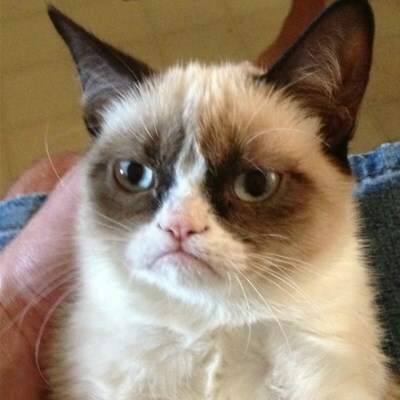 Crankiness and despise remain too often buried inside us but the Grumpy Cat is our great chance to let it all out. This disgruntled, surly-looking cat is actually named Tardar Sauce and lives happily (hard to believe!) in the Unites States. Her expression is due to a sickness of hers which, however, does not prevent her from a pretty normal cat life, and that won her an incredible fame on the internet. Tardar Sauce became a star in 2012, when her picture was posted on Reddit. From that moment on, grumpy people all around the world used her expressive face to finally speak their minds! Create your Grumpy Cat Meme If you want to generate a “Grumpy Cat meme” you are probably a type that doesn't get excited so easily. However, it is so simple that might make you rejoice, for a change! In a couple of very simple steps you will obtain a fantastic super-cranky royalty free meme. Just click on the button “create a meme” and let your cynicism out in a couple of sentences that will be placed respectively on top and at the bottom of the image. Let all your grumpiness out at Memegenerator.net and the result will be extraordinary!